Grant Godfrey poses with his trophy after winning the Greater Cleveland Amateur Championship Sunday at Sleepy Hollow Golf Course. 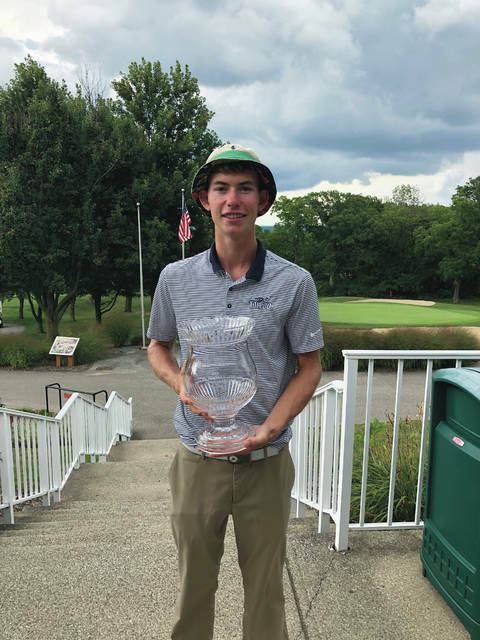 Grant Godfrey started strong and never looked back en route to wrapping up first-place honors during the Greater Cleveland Amateur Championship Friday through Sunday at Sleepy Hollow Golf Course. The former Delaware Hayes Pacer and current Toledo Rocket had three birdies on the way to an even-par 71 on the first day of the 54-hole event — a mark which put him in a three-way tie for first place. Godfrey carded a second-round 73 with four birdies to stay in the top two heading into Sunday’s final round — a round in which he shot a 72 to take the title by one stroke. A clutch putt on 18 helped him seal the deal, but Godfrey said his ball striking was the difference. The event was his last of the summer before heading back to college.